"Brokeback Mountain" is up for eight Oscars, leading the field of nominees: Best Picture (which would go to producers Diana Ossana and James Schamus), Best Director (Ang Lee), Best Actor (Heather Ledger), Best Supporting Actress (Michelle Williams), Best Supporting Actor (Jake Gyllenhaal), Best Adapted Screenplay (Larry McMurtry and Diana Ossana), Cinematography (Rodrigo Pietro) and Original Score (Gustavo Santaolalla). 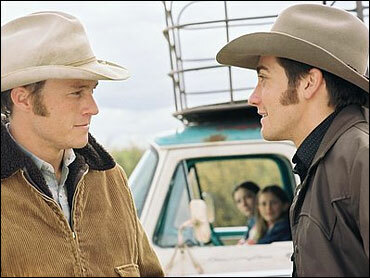 The film stars Heath Ledger and Jake Gyllenhaal as Western roughnecks who share a summer of love while tending sheep in the 1960s, then carry on a lifelong romance they conceal from their families. Williams co-stars as Ledger's wife, who overlooks her husband's affair to try to hold her family together. "Brokeback Mountain" is based on a short story by E. Annie Proulx. It was first spotted in The New Yorker by Diana Ossana, who co-wrote the screenplay with Larry McMurtry and also co-produced the film. Director Ang Lee already has won many other awards for his work on the film, including the Golden Globe and the trophy from the Directors Guild of America. See photo menu for pictures of the premiere of "Brokeback Mountain" on the East and West coasts. See photo essay for more pictures of Heath Ledger. See photo essay for more pictures of Jake Gyllenhaal. See photo essay for more pictures of Michelle Williams. See photo essay for some photos of Ang Lee and his cast at the Directors Guild awards ceremony. See Turning The West Upside Down for a CBS News Sunday Morning report about the movie's screenwriters. On CBS News Sunday Morning, correspondent Rita Braver reported that everyone connected with the film insists that it is much more than an iconoclastic depiction of love between two cowboys. "It doesn't present any kind of agenda, any politics at all, one way or the other at all," McMurtry says. "It just says life is not for sissies." He elaborates, saying, "Ya know, you need strength. Love is not easy. If you find it, it's not easy. If you don't find it, it's not easy. It's not easy if you find it, but it doesn't work out, it merely says, the strong survive, but not everybody is the strong and many people don't."